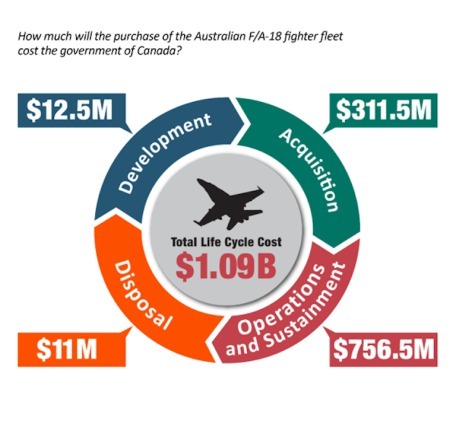 This report provides an independent estimate of the impact of the costs of Canada’s procurement of 18 Australian F/A-18 aircraft on the federal budget. This estimate is for a total life cycle cost, thus taking into consideration the total cost of project development, acquisition, operations and sustainment, and disposal of the additional aircraft. 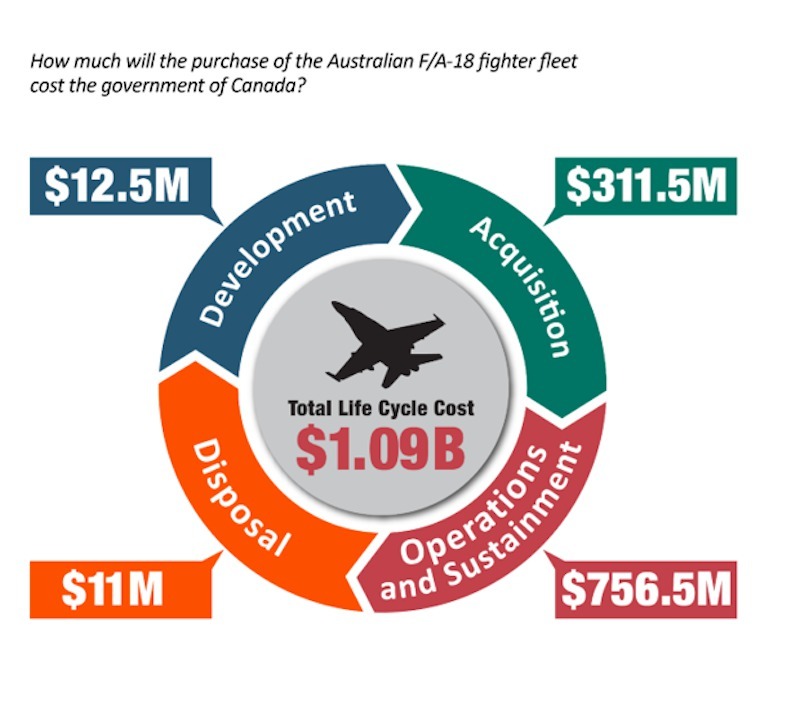 The findings of this report are as follows: the risk-adjusted life cycle cost estimate of the Interim Fighter Capability Project is approximately $1.09 billion, with a low-end estimate of $1.08 billion and a high-end estimate of $1.15 billion. Breaking this down into the project’s phases, PBO has estimated a Development phase cost of $12.5 million, an Acquisition phase cost of $311.5 million, an Operations and Sustainment phase cost of $756.5 million, and a Disposal phase cost of $11 million. The total estimated life cycle cost of 1.09 billion is some 22% higher than the Department of National Defence (DND) estimate. This is largely driven by costs in the operations and sustainment phase, where the PBO has estimated life extension and upgrade costs that are approximately $120M higher than DND’s. Sensitivity analysis surrounding changes in planned flying rates show that the total project life cycle cost estimate can vary by as much as $55.5 million. A delay in the completion of the acquisition phase by one year, such that deliveries of six aircraft slip into the 2022-2023 fiscal year, would increase total project costs by $12.5 million. The Department of National Defence (DND) welcomes the Parliamentary Budget Officer’s Fiscal Analysis of the Interim F-18 Aircraft; we have a good relationship with this office, and value their work. -- And second, the PBO figures for upgrades of the interim fighter fleet include estimates for CF-18 combat upgrades; we are still producing options for these upgrades. DND’s methodology for full costing has been developed over the last several years and validated in the development of the Strong, Secure, Engaged defence policy. While we are confident that our methodology is sound, we will continue to work with the PBO, the Auditor General of Canada, and other outside entities as part of our commitment to responsible use of taxpayer dollars. The first two interim aircraft arrived in Cold Lake on February 16, and modifications have already begun to Canadianize them. We look forward to unveiling them in RCAF colours and ready for their first Canadian mission in the coming months.